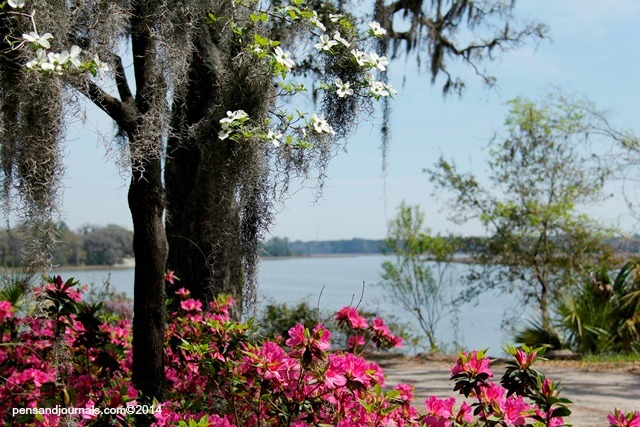 When the azalea’s blossomed, when nature came alive, when surrounded by spring, something else sprung up–Bob’s allergies. That was the beginning of this new journey–when our path changed direction. Bob’s allergies with his watery eyes and runny nose led to head congestion, chest congestion, cough and a fever. After days of Claritin, Ibuprofen, and cough syrup, without much relief, he knew it was time to see the doctor. It was a Friday afternoon. He didn’t want to wait over the weekend so he decided to drive to the doctor’s office. “Aren’t you going to call before you go”? I asked. “No, I’m just going to show up”, came his response. Then off he went. It was mid-day. I had my doubts whether the doctor would be able to see him without a scheduled appointment. Upon his arrival, the receptionist informed him that they didn’t schedule any appointments that day, because the staff attended a conference. They had just returned and were getting ready to lock up for the weekend. The doctor was still there and was able to see him. Bob couldn’t have asked for better timing. The diagnosis — a secondary infection due to his allergies. His physician prescribed antibiotics and an inhaler. Then, out of the blue, the doctor ordered some routine blood work. Bob wasn’t due to have blood work done for 7 months when he’d be back for his annual physical, but he followed the doctor’s orders. The results came back indicating that Bob had an elevated white blood cell count. “You had a respiratory infection when they did the test. More than likely it’s from that”, I remarked. The doctor also thought it could be from the infection but decided to check further. After Bob fully recovered from his respiratory illness, he went to the lab for another blood test. The result–an elevated white blood cell count. Another blood test a week later confirmed the results. At that point, the doctor became concerned and his concern led to our concern especially when he said, “I don’t want to worry you but this could be the beginning stages of something serious. I’m referring you to a Hematologist”. Leukemia? Did the doctor just tell us that my husband has Leukemia? I sat there trying to process the word. L e u k e m i a. The real world seemed distant. What we heard and where we were sitting seemed surreal; almost dream like. Reality set in with every question that we asked and with every answer from the doctor. The Hematologist informed us that there were several different types of Leukemia–the acute Leukemia’s that are extremely aggressive and the chronic types, which grow slower. Since Bob felt good and his white blood cell count stayed at the same level for several weeks, the doctor told us that there was a good chance that he had a chronic type. Those words became our glimmer of hope. We came home to process the news and to get ready for his bone marrow biopsy. The bone marrow biopsy was necessary to confirm what type of Leukemia it was and to stage it. They scheduled the biopsy for the following week and another trip to the lab to prepare for it. Then a phone call from the Hematologist, “We can’t do the biopsy. You’re testing positive for an autoimmune syndrome that affects blood clotting and we need to do some investigating before proceeding with the biopsy”. More in-depth blood tests had to be done and sent out to several labs. That meant more waiting. While we waited, we did some research, prayed, and asked others to pray. The results were back in a week and showed that the Leukemia was Chronic Myeloid Leukemia or CML, a type that will need treatment-more than likely an oral medication and strict monitoring of his blood. A bone marrow biopsy would still be necessary to confirm the findings. After his doctor conferred with other specialists, they determined that the autoimmune syndrome may or may not be caused by the Leukemia. They couldn’t be certain. There wasn’t a test that could be done to give us a concrete answer but his doctor assured us that it would be safe to go ahead with the biopsy. Bob had the biopsy last week and now we’re in another waiting period. We will receive the results in a few days. We are grateful and comforted by the outpouring of love and support from family and friends. 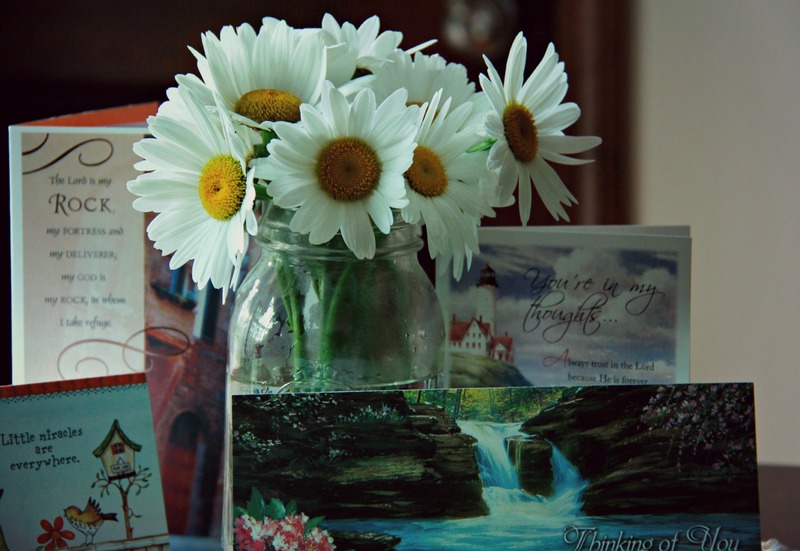 Each note, text, email, call and card confirms that many are thinking of us and praying. During the weeks leading up to Bob’s diagnosis (even before we knew that he would be seeing a Hematologist) I was drawn to Lamentations 3: 21-24 in the Bible and focused on that passage for weeks. I shared this scripture in earlier posts including, New Every Morning. It was my go to verse. The one I was reading, re-reading and sharing with Bob over several weeks. It was the verse that I had just read before reading his email. Some may call this a coincidence. I call it God’s mercy. 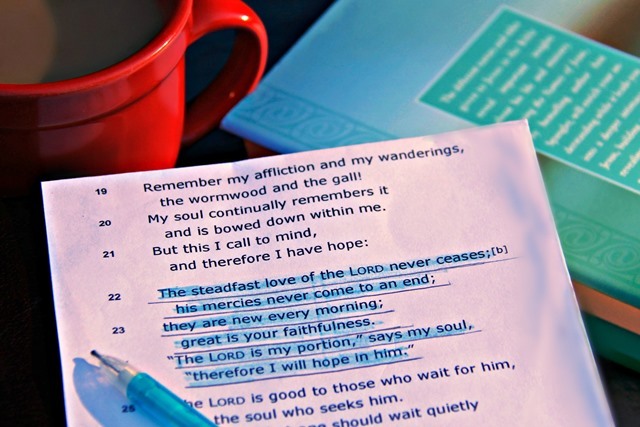 His mercies never come to an end – they are new every morning; great is his faithfulness. Bob and I will hope and trust in God who continues to confirm that his mercies will always come right on time. Hearing your’s and Bob’s story then also seeing it in writing just affirms God’s love, caring and perfect timing. You just know God’s hand has been in all of this and will continue to be. What alot of comfort for you and for us. Love you two. First of all I love your writing. I think it is almost therapeutic to write the events and what has led to where you are now. You already know God is holding you both. I don’t believe in coincidence, I believe it was always God’s plan. He wants us to trust in Him in all things. He is assuring you both that He is not just with you but will carry you through. Also what your pastor wrote, Yes, we need to live in the moment. Take one day at a time. Our minds want to jump to all the what if’s and if we let it, we can becomes very overwhelmed with things that haven’t even happened yet or may not ever happen. Rest in the Lord, take one day, one test, one treatment at a time. Know many people care about you, love you and are lifting you up in prayer. Continue to rest in Him ” and the peace that passes all understanding with keep your hearts and minds through Christ Jesus our Lord.